Heat oil in a large frying pan or wok over medium-high heat. When hot, add onions, turn to coat, and cook 1 minute to sear and soften. Remove 2 tbsp. onion rings for garnish and set aside. Stir in garlic, then cabbage and 1 1/2 tsp. salt. Cook, stirring constantly, until evenly but barely wilted, about 2 minutes. Remove pan from heat. Cut lemon in half and squeeze in about 2 1/2 tbsp. juice. Taste and add more if you like. Toss with herbs, more salt if needed, and plenty of pepper. 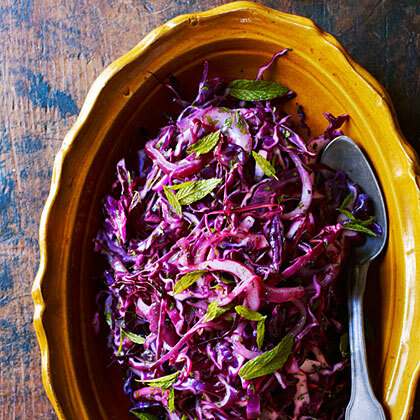 Transfer cabbage to a platter, mounding it in a heap, and sprinkle with reserved onion rings and the small mint leaves. Make ahead: Sliced cabbage, up to 1 day; finished dish, up to 2 hours (except for garnish, which should be last minute).